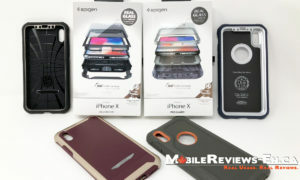 Today we’re going to do a quick review of the Spigen Tough Armor FX. This is essentially a Spigen Tough Armor with a screen protector included. The screen protector, or Crystal Protection COVER is all caps, is the only difference that we can tell between a regular Tough Armor and the FX version. Unlike other screen protectors, this screen protector doesn’t stick to the face of the iPhone but attaches to the edge of the Tough Armor instead. We’ve taken a loot at the older Tough Armors and discovered that Spigen did change them slightly which is nice since we’re not big fans of companies just packaging different components and calling it a new product. The majority of this review is going to be focused on the screen protector as the actual Tough Armor remains largely unchanged. Based on our time with the Tough Armor FX, we’ve given it a score of 4.3 Eh’s out of 5. The addition of the screen protector makes the FX better than the regular version but there is a fatal flaw with the setup which my scoring system doesn’t take into account. If you’re looking for something similar, slim with a decent screen protector, check out the Speck MightyShell with Faceplate. If you’d rather see all the other cases that we’ve reviewed, check out our comparison tool! Design – You get to choose how to use your iPhone? In terms of design, the Crystal Protection COVER is only .28 mm thick which we’ve confirmed which makes it one of the thinner screen protectors out there. 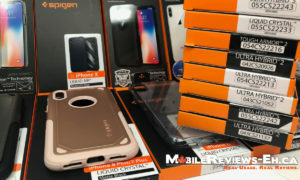 Attaching the screen protector isn’t too difficult but make sure you have the right side facing out as our first attempt to install the screen protector for our Spigen Tough Armor FX Review was pretty painful. The screen protector has notches that fit into the side of the Tough Armor so if you wanted to remove the screen protector, all you have to do is press the edge of the case outward and it should pop out. These notches are unique to the Tough Armor FX version of the case as our regular Tough Armor doesn’t have those notches so you can’t easily interchange the screen protector with another Tough Armor. 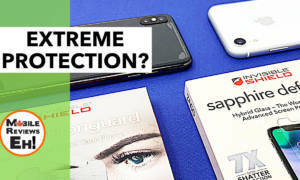 Protection – A screen protector that might damage your screen? In terms of protection, the Crystal Protection COVER (in all caps) is not terribly scratch resistant. Coins will scratch the screen protector and over a span of 8 days, our screen protector began to show quite a few little scratches. Now the fatal flaw that we mentioned at the beginning of the review deals with the level of dust and debris that will end up between the screen protector and iPhone. The footage and photographs in our Spigen Tough Armor FX review video are of an iPhone 6 Plus after 1.5 weeks in the Tough Armor FX and you can definitely see dust and debris getting in between the screen protector and the iPhone. This is a problem that occurs with no adhesive screen protectors and generally, we wouldn’t go out of our way to recommend the Tough Armor FX to people working in really dusty environments. The viewability of your iPhone under the screen protector suffers a bit. If you look closely enough, you’ll notice that the screen protector has a bunch of little dots on it but unless you’re really looking, its not going to effect the quality of the iPhone’s touchscreen. Glare is a bit more noticeable with this screen protector as everything doesn’t seem as crisp but there isn’t any rainbowing which is nice. There isn’t much in terms of sensitivity loss, despite not being adhesive, which was surprising to me. Have questions about our Spigen Tough Armor FX Review? Please ask them on our Google+ page or on our Facebook page.